The SW4000 Rider Sweeper is highly productive and reliable, so it can provide excellent cleaning performance even in rough sweeping conditions. It is equipped with a hydraulic high dump, providing safe and effective debris removal. The front wheel steering and drive work to give the operator the utmost manageability, even in close corners and narrow aisles. 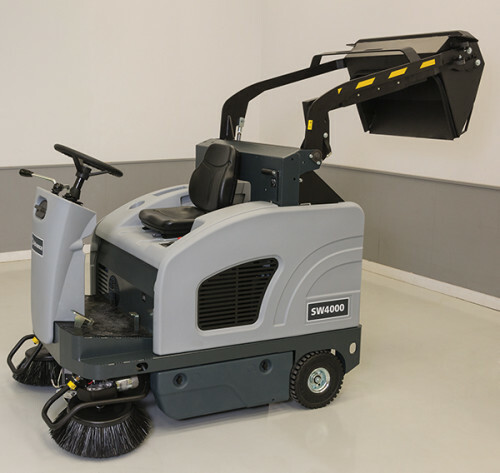 This sweeper provides a top-notch swept finish both indoors and out, making it deal for parking lots, warehouses, and other industrial environments. 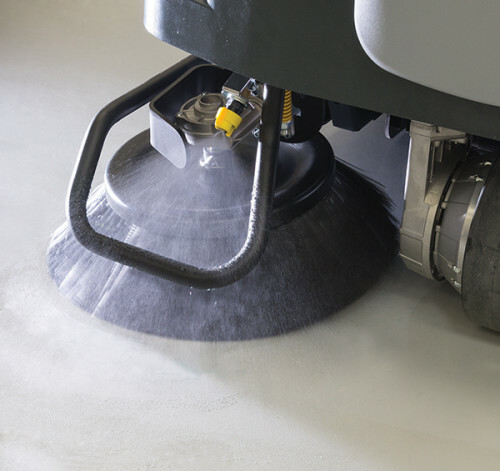 The SW4000 is equipped with One-Touch™ sweeping, which enables all the machines functions when the sweeper is moving. This includes the main broom, side brooms, and DustGuard™ if the machine is equipped with it. The innovative One-Touch™ sweeping system reduces wear on brushes and maximizes run-time, providing up to 4.5 hours on a single charge. Safe dumping is easily accomplished due to the operator’s clear view and the high dump hopper. DustGuard™ misting system is an optional feature that enhances dust control performance by 75% when compared with the competitor’s machines. The multi-frequency Liberator™ timed filter shaker helps to achieve maximum dust control by keeping the filter dust free. 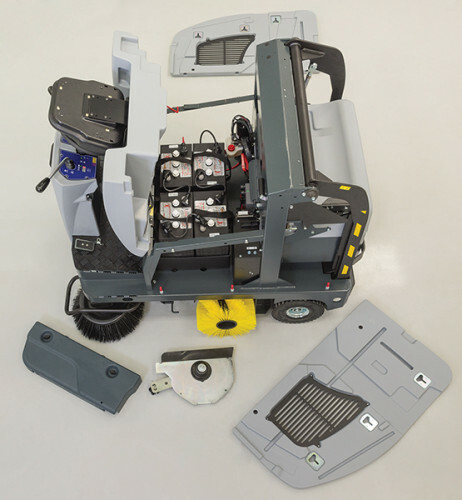 The sweeper was designed to eliminate the risk of damage to the machine by including steel guards and spring-loaded side brooms that are retractable. In addition, the controls are mounted and the seat is adjustable, making it intuitive and user-friendly. Routine battery, filter, and broom maintenance is made quick and simple because it does not require tools. The SW4000 hopper can be raised to a height of 63", making it easy to dump debris directly into a waste receptacle while the operator remains seated. The hopper assembly can hold 2.6 cubic feet of debris and lift up to 220 lbs of collected debris. Since the SW4000 uses an over-throw sweeping method, you get full utilization of the entire hopper capacity.